There have been reports of issue with Seasons. I have had no issue with a Supernatural/Season combination, with and without Nraas mods. Does not matter. Using Any Game Starter I've tested the mod using both expansions without the other, everything works fine. Charm Interactions finally have the Drink Animation. Thanks Sauzer for getting it for me. Attack Interactions has just a Fight Animation. Accidental death. 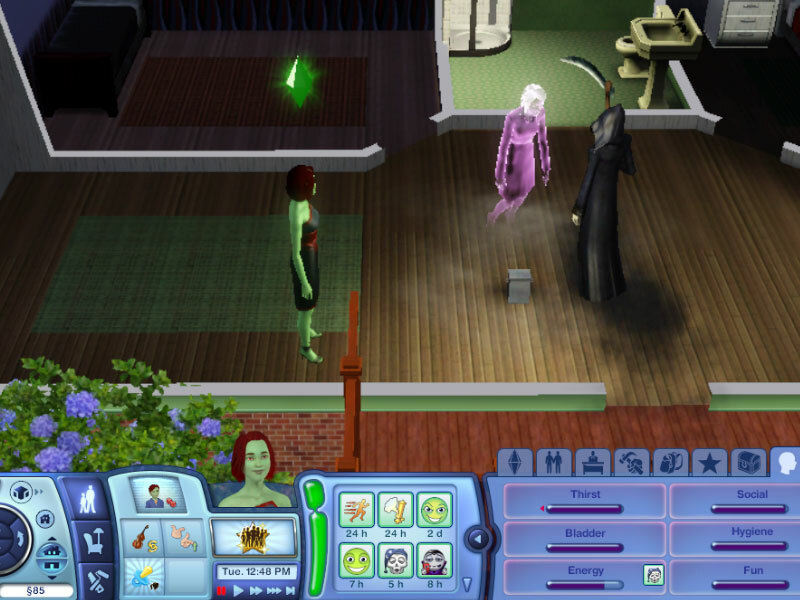 If you drink from a Sim while they still have the weakened moodlet (lasts about 22 sims hour) they will die from blood loss (except for Pregnant Sims, strange coding thing). Works for both Late Night and Supernatural (together or separately). Any issues, problems, glitches? I prefer pms past the initial comment. They are quicker to access. PMs concerning problems should contain patch number, expansion packs, hacks/mods being used, and a description of what is going on. If for some reason the interaction is not showing up. Check to make sure your mod folder is set up the same way as the one in this tutorial. Also make sure your vampire has at least a level 1 in Athletics or Charisma before you start to panic. So I've been playing Late Night and I got it mostly because of the vampires. I'm a bit of a vampire fan. Anyhow, the relationship thing bugged me a bit then there was some tuning mods to deal with that... But what about the more violent side of vampires that actually killed people? Tada! 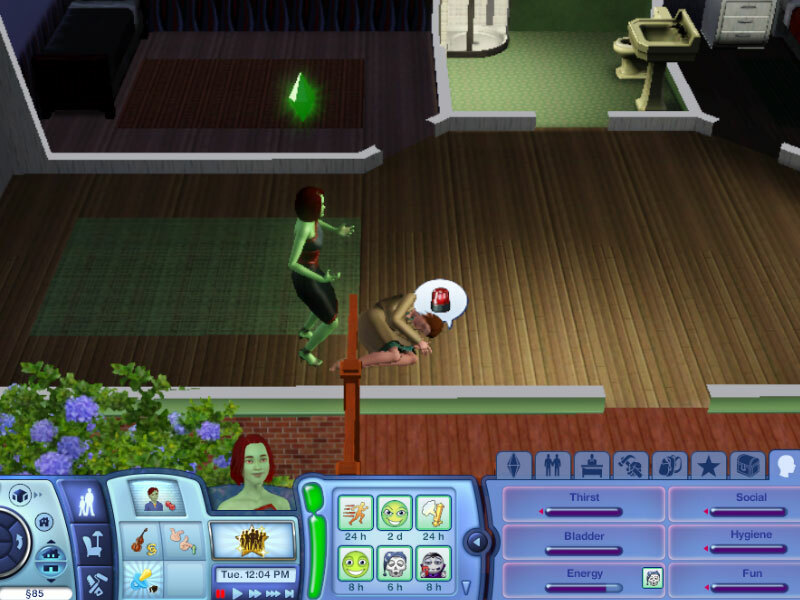 My mod gives you the option to attack/charm and kill other sims while maxing your thirst bar. 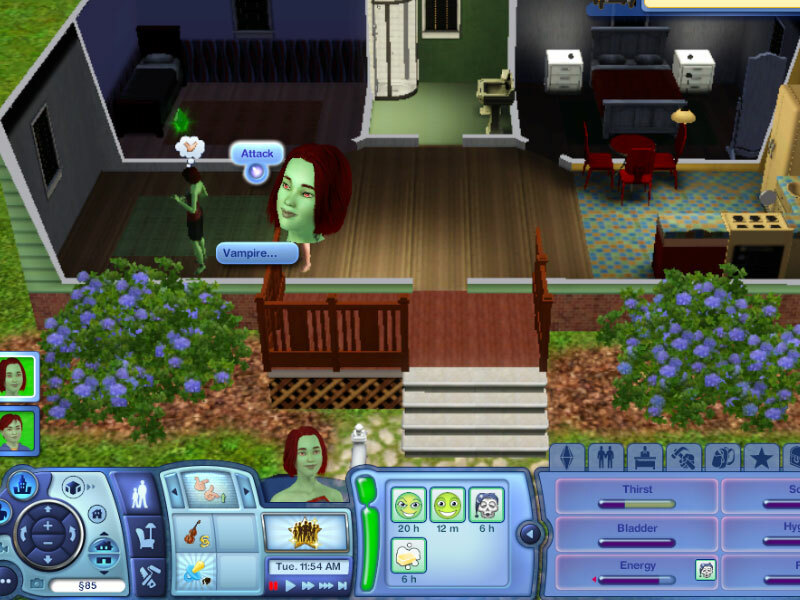 The target sim dies of starvation and as of right now can only be teen or older (mature version) or young adult or older (EA standard). EA Standard includes the typically ya/ma/elder and no pregnant people drinking limits. 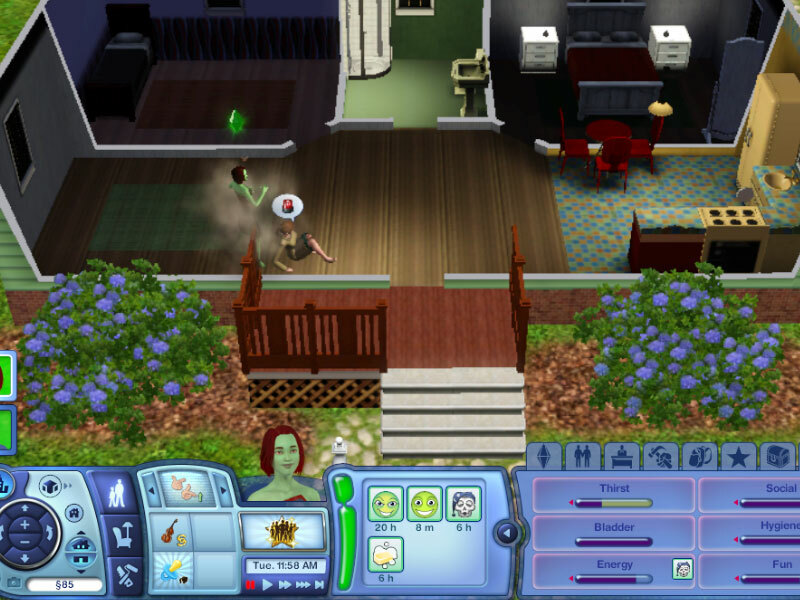 Mature allows for all four interactions to be used on teenagers. The non-deadly interactions can be used on pregnant people. When a pregnant person is drained: for Charm there's a 25% they'll lose their baby, for Attack there's a 50% chance they'll lose their baby. This is due from the trauma of losing blood. This is a scripting mod, *not* a core mod. If you have an issue, please pm me with patch number, expansion packs, mods being used, and also what the problem is and scenario behind it. *Your vampire thirst motive is maxed when restarting the game-- ie your vamp is thirsty when you quit the game, go back in and is full. Not exactly a bad glitch. Will look into fixing it. 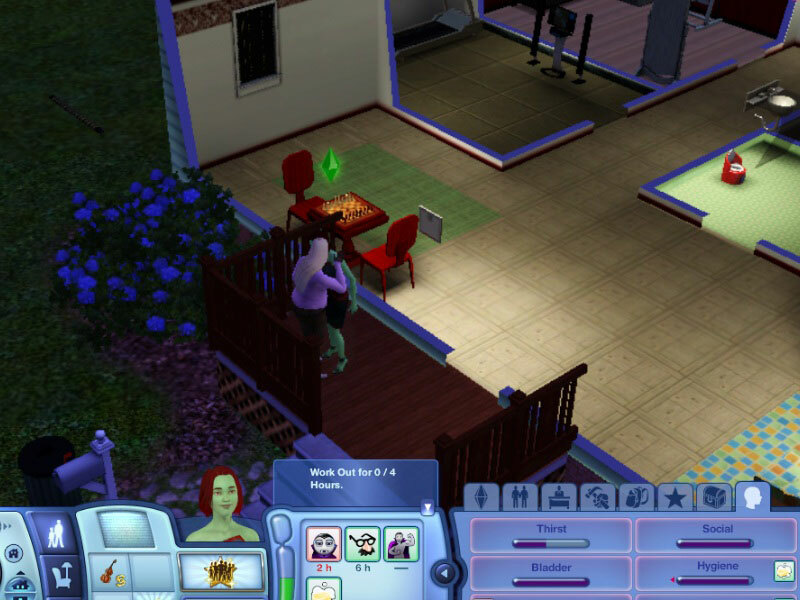 *Try for baby Mod Conflict: I've received two report that with the 1.26 patch the user experience a glitch. 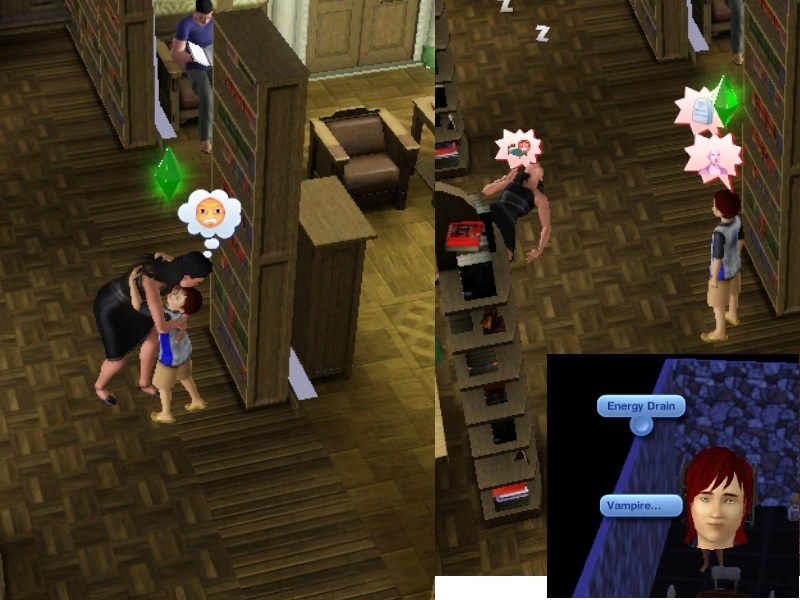 This glitch occurred when they were doing try for baby and the interacting sims pretty much resetting (ie like doing a resetsim on them). It appears to be a conflict glitch since in a clean environment with this mod in there (and in base game), there is no glitch with patch 1.26. Further investigation is being done to see with which other mod creates the conflict. UPDATE According to one reporter, it only occurs when they're on vacation somewhere using the WA ep. Since I do not have WA, I cannot test that scenario. When you click on a viable target, you'll see a new pie menu button "Vampire...", clicking that will give you the option to "Attack", "Deadly Attack", "Charm", or "Deadly Charm". I got the idea from some chapters of the manga Vampire Knight where the children of the vampire there take a person's life essence. A victim can "fight" back and get away without being bitten. For the Charm interactions if their Charisma skill is equal or greater to the vampire, they won't be bitten. For the Attack interactions, if their Athletic skill is equal or greater to the vampire, they won't be bitten. In the case of a fail attempt, a little message with pop up showing the skill levels of the vampire and the victim. Slightly autonomous. Charming/Attacking can occur if the vampire gets really thirsty, but they're more inclined to go get plasma. So can energy drain but that's not fatal.